I don't usually read crime novels but I do love to support WA Authors, so when the opportunity arose for me to interview Alan Carter in November, I said yes please and hopped to the task of reading his latest book. Alan Carter is originally from the UK, but now lives in Western Australia. He is the author of the three Cato Kwong novels, Prime Cut, Getting Warmer and Bad Seed which examine the fictional seedy underbelly of Perth. 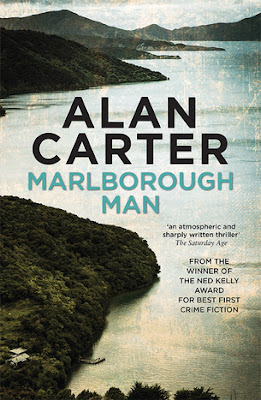 Marlborough Man is described by Carter in his acknowledgements as a 'temporary conscious uncoupling with Cato'-- it follows Sergeant Nick Chester, originally from Sunderland in the UK but now living in the Marlborough Sounds in New Zealand, after an under cover job he did as part of SOCA (Serious Organised Crime Agency, I think...) put him in the cross hairs with a dangerous crime boss. Nick lives in one of the most beautiful, isolated places in the world, and this setting plays a key part in the story. It's a good place for him to hide from his past, but it's also a terrifying place to be alone and far from help. The landscape, as evoked in Carter's writing, possesses a terrible beauty, and a sense of long history. Some of Carter's descriptive passages had me wanting to hop on a plane and get myself over to New Zealand for a first hand look. That sort of powerful description is not something you expect from a crime novel, so I was pleasantly surprised. The plot of Marlborough Man has many strands to it, but Alan Carter manages to weave these all together in a well-paced and satisfying way. First, there is the cat and mouse game aspect: Nick, his wife Vanessa, and their son Paulie, are in danger as Nick's past appears to be catching up with them. Meanwhile, a child murderer known to police as The Pied Piper strikes again. Nick finds a link to an older crime, and with the aid of his sassy, tough and thoroughly likeable offsider, Latifa Rapata, he befriends members of the local Maori community, when he discovers that the death of one of their own may hold the key. While I'm sorry to say I did guess who the killer was before the end, the solution to the complex puzzle laid out for the reader had clearly been meticulously planned, and while it wasn't obvious, all the clues were there if you wanted to solve the case alongside the protagonist. At times, I found the endings of the chapters a little bit abrupt in this book-- sometimes, this attempt at leaving the story on a cliffhanger hit the mark, and other times, it just seemed to cut off with a bald statement, but this was the only aspect of the writing of the story which jarred with me. Would I read another Alan Carter novel? Yes, I think I would. I gave Marlborough Man four stars. If you would like to hear Alan Carter speaking about Marlborough Man, you can catch him at the Bassendean Memorial Library on Wednesday November 1. Please see the library's website for more details.